Osteochondrosis is a term used to describe a group of disorders that affect the growing skeleton. These disorders result from abnormal growth, injury, or overuse of the developing growth plate and surrounding ossification centers. The exact etiology of these disorders is unknown, but genetic causes, repetitive trauma, vascular abnormalities, mechanical factors, and hormonal imbalances may all play a role. 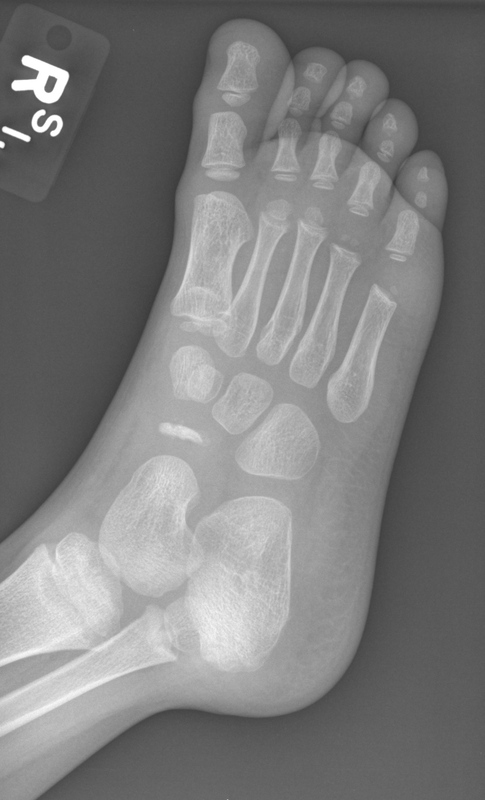 Juvenile Osteochondrosis is the injury the growth plate of the affected limb. There are growth plates located throughout the lower extremity and close at various time as the child ages and matures. There are severa types of injuries based on the location in the foot and ankle.Legg-Calvé-Perthes disease is a hip disorder that causes hip pain, an atraumatic limp, and knee pain. Osgood-Schlatter and Sinding-Larsen–Johannson diseases are common causes of anterior knee pain that is aggravated by jumping activities and kneeling. Sever disease causes heel pain that is exacerbated by activity and wearing cleats. It often mimics Achilles tendinitis and is treated with activity and shoe modifications, heel cups, and calf stretches. Freiberg disease and Köhler bone disease often cause foot pain and are disorders of the metatarsal head and navicular bone, respectively. Radiographs show sclerosis, flattening, and fragmentation of bone in both diseases. Kohler’s is a condition of the navicular bone in the top inside of the foot. It is a relatively infrequent condition that affects children most commonly between the ages of 3 and 7 years old as this bone is starting to develop. A temporary interruption of the blood supply to the bone. 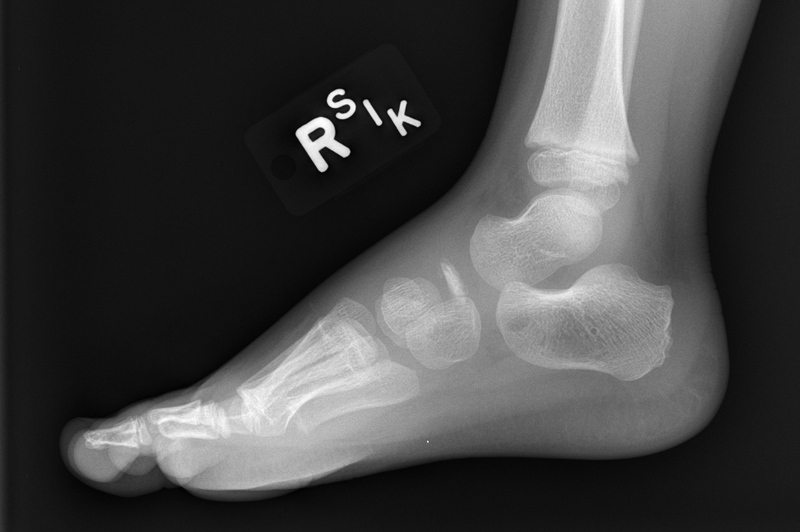 Maybe caused by minor or major trauma to the midfoot region. Pain and tenderness is present across the top and inside of the foot. The bone sits just in front of the ankle on the inner portion of the foot almost at the highest peak of the arch. Swelling if present is usually to a very low degree. No discoloration is seen. The child is often limping and trying to avoid that area of the foot. The child will often walk on the ball of the foot although frequently on the outside of the foot and ankle, preventing the heel and inside of the foot from moving towards the ground. When the child moves the foot down and in, pain is often present to the inside of the foot towards the ankle. X-rays reveal whitening and thinning of the bone. The bone will appear to be denser than the bones around them. During the acute phase of this injury, the child is best placed in a cast below the knee with the use of crutches. This will allow the area to rest and heal without any long-term problems. A boot should then be applied once the child is able to put weight on the cast for a week. This is followed by an orthotic to be placed in the shoe to continue to support the area and prevent the foot from breaking down. Freiberg’s disease most commonly affects children between the ages of 10 and 15. The metatarsal head, which is one of the primary weightbearing areas of the foot, may have a temporary interruption of the blood supply to that area. Pain, swelling and difficulty weightbearing are most common when a child or teenager begins to walk. It is more common in females than in males. Temporary interruption of the blood supply to the end of the bone which can be seen with low-grade micro trauma to the area. This can be seen in sports that require the young athlete to do repetitive movements on the ball of the foot. Trauma to the ball of the foot, as a child or teenager may jump from a height landing hard on the ball of the foot, causing injury to the blood supply to that area. 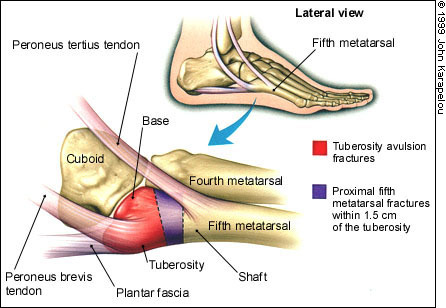 Structural abnormalities are common in which the second metatarsal is much longer than the other metatarsals. Metabolic disorders must be ruled out. Pain, tenderness and swelling are present on the top and bottom of the foot usually behind the second toe. It may also uncommonly occur in the third or fourth metatarsal head as well. Pain with movement of the second, third or fourth toes in a flexed or extended posture. Avoidance of all weight on the ball of the foot is seen as the child walks on the heel or the outside of the foot to avoid pressure to the affected area. May be normal at first in the earlier stages. With time can progress to flattening of the metatarsal head as it loses its normal rounded appearance. Fragmentation and arthritis in the joint may be a late development. It is important to identify the injury at its earliest stage to prevent the head of the bone from collapsing which can cause arthritis in the second toe joint. Immobilization in a boot that extends beyond the toes coupled with the use of crutches will help to take pressure off the area and allow the blood supply to improve to the bone and healing to take place. Immobilization may be necessary for 6-12 weeks. Following immobilization when weightbearing is pain free, the child or teenager is transferred into an orthotic in their shoe to avoid pressure to the metatarsal affected. Avoidance of activity on the ball of the foot for a period of months will allow uneventful healing if bony changes have not taken place. If collapse of the bone is seen, surgery may be necessary to remove damaged cartilage and decompress the joint to take stress off the area. If seen early, this condition should cause no long-term problems. If seen late, osteoarthritis and pain may be a long-term consequence. Below is an example of Freiberg' infarction of the second metatarsal head. Iselin disease is painful irritation and inflammation of the growth plate (apophysis) at the base of the 5th foot bone (metatarsal), where one of the calf muscles inserts. In a child, the bones grow from areas called growth plates. The growth plate is made up of cartilage, which is softer and more vulnerable to injury than mature bone. Iselin disease is most often seen in physically active boys and girls between the ages of 8 and 13 years of age. It is most common in soccer, basketball, gymnastics and dance. Iselin disease is an overuse injury caused by repetitive pressure and/or tension on the growth center at the base of the fifth foot bone (metatarsal). Running and jumping generate a large amount of pressure on the forefoot. Tight calf muscles are a risk factor for Iselin disease because they increase the tension on the growth center. Your child will complain of pain along the outer edge of the foot that is worse with activity and improves with rest. She may limp or walk on the inside of the foot. The growth center may be enlarged, red, and painful to the touch. Your doctor can diagnose Iselin disease based on a review of your child’s symptoms and physical examination of her foot. X-rays are not required to make the diagnosis. Your doctor may order X-rays to evaluate for other causes of foot pain. X-rays will show the growth center, but the inflammation (apophysitis) cannot be seen on an X-ray. Your child will need a short period of rest from painful activities in order to take pressure off the growth center and allow the inflammation to resolve. Ice is very helpful in reducing pain and inflammation. Apply ice for 10-15 minutes as often as every hour when sore. Do not use ice immediately before activity. It is very important to stretch tight calf muscles in order to relieve tension on the growth center. If rest, ice, and stretching do not relieve the pain, your doctor may prescribe an anti-inflammatory medication. Shoes that fit well and have good arch support can decrease the pain. Depending on your child’s foot shape and structure, your doctor may recommend custom-molded shoe inserts. In severe cases, 2-4 weeks of immobilization with a walking cast or boot may be necessary. If the pain recurs when she returns to sports, she should rest, ice and stretch until the pain is gone before trying to return again. Perform a proper warm-up before starting any activity. Ten minutes of light jogging, cycling, or calisthenics before practice will increase circulation to cold muscles, making them more pliable so that they put less stress and tension on their attachment sites (apophyses).